Natural herbal remedies for dogs provide an excellent source of dog nutrition from plants, in whole food form. This is exactly the way Mother Nature intended. Herbs provide your dog with extra health and nutrition benefit and have been used for thousands of years as natural healing remedies when medicinal advantage was required. Those were the good old days! Here's Pager and Teddy upfront with their friend Kiko behind. 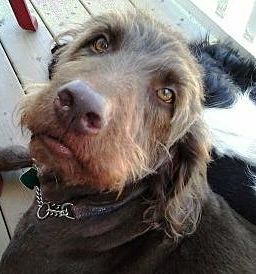 Thanks to natural herb remedies, Pager(L) recovered from his serious health problems. Did we have fun or what, Boyz? Many people find their way to this website because they are searching for natural solutions to their dog health problems. Would that be you, by any chance? Every day I get emails from unhappy, worried dog owners. 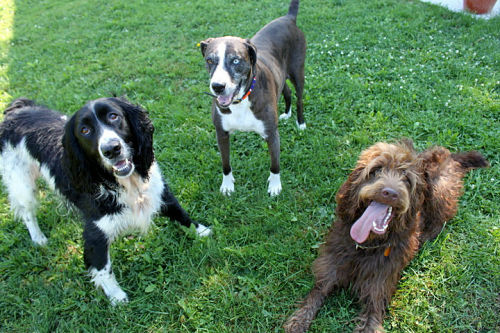 Most of them are at the end of the line trying to solve their chronic dog health issues. Their bank accounts are empty and the dog still has health problems despite many visits to the vet. Dog nutrition naturally, in other words. Isn't that the name of this website? Dog nutrition is so important because food heals, folks! We all eat food to nourish our bodies. That includes dogs! For example, if your dog is 5 years of age, then it would be five months plus three months. Eight months in total! And even then, it could be longer depending on those things I mentioned above. Each dog is a different and unique individual. Some people use their natural herbal remedies herbs for a while, and then quit. Why would you stop? Giving your dog herbs is a healthful thing to do all the time. That's what I do! Herbs for dogs will keep your dog healthy and help to prevent other dog health issues over time. So I must ask again. Why would you quit using a natural herbal remedy? Here are a few good reasons why you should continue. What Exactly Is a Natural Herbal Remedy? Herb remedies are made from whole plant parts such as seeds, berries, bark, leaves, stems, roots and flowers. They can be used on their own or in combination with other plants or parts of plants, to increase the synergistic, beneficial effect. Herb remedies are available in many forms. In the 19th century, scientists learned how to extract the active chemical components in plants to make compounds which have since become available today, as drugs. Nearly one fourth of all drugs known today originated from plants. An example is aspirin which comes from white willow bark, a common natural health remedy for pain relief. I have learned that people use an enormous amount of nutritional health supplements for their dogs. If you are continuing to have dog health problems, logic would tell me that much of your effort and money spent on these remedies is going to waste. Why? Here are the three main reasons. Trusting dog owners haven't a clue about how to properly use herbal remedies for dogs to obtain maximum benefit. The herbal products used simply aren't used for long enough to see benefit. 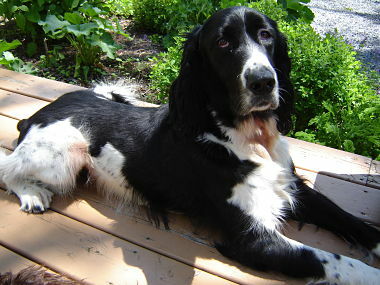 the herbs for dogs I recommend and use myself, are of the highest quality possible. I can tell you more about that. my mission is to teach you how to use herbal remedies for dogs so you can do it yourself. Education and dog health coaching is what I do. if you don't use what you learn and don't use my recommended natural health remedies for dogs long enough, you won't reach your goal of better health for your dog. It will take effort and commitment on your part. Health and herbs go together naturally. Plants have been used to improve health since long before recorded history. Nothing has changed today. Just because we have drugs today, doesn't mean that plants and natural herbal remedies don't work. They sure do! High quality, life enhancing plants in the form of herbal remedies for dogs can and do, build better health starting from a deep core, cellular level. This is the only way true healing can happen. ﻿That's the bottom line! I believe that herb remedies play an important role in this process of healing. Herbs heal. That's the bottom line. Here Are Some Well Known Plants Used as Herb Remedies. 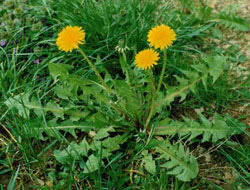 Read about my Pager's natural instinct to eat dandelions in the spring. All animals wild or tame, are aware of how to heal themselves. Their natural instincts will guide them to use what's available to them, wherever they are. Teddy was born with a Grade 4 heart murmur. He loves his Hawthorn Berries. They help to keep his heart beat regular. Teddy also gets a herbal combination in dry capsule form to keep his liver and kidneys in tip top detoxing shape. This is the way the body heals or ﻿cures itself. All ﻿natural cure starts from within and moves outward, from the head down and in reverse order as the symptoms have appeared or been suppressed.